The first winged roller coaster built on British soil is has begun testing ahead of its opening this Spring. The ride is apparently so violent that some test dummies have come back sans limbs. 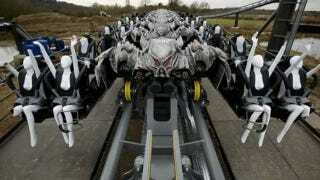 The Swarm is being built at Thorpe Park in Surrey. Being "winged," riders' legs will hang freely from their seats as they rocket around at 62MPH. Problem is that some of the testing dummies began coming back missing bits that actual people would probably notice. So, the park called in air-force pilots to provide a second opinion. "I am a self-confessed adrenaline junkie but even as a pilot used to G-force there were some gut-wrenching moments, and I have to admit the near miss element is eye-watering - you really do feel as if you are going to crash into the structures,'" pilot Mark Cutmore told the Metro.